After unveiling the same in Oct this year, LG Electronics has now put a launch date to its G Flex phablet- the first device from the company to sport a curved display. The phablet will be available for purchase in the Indian market in Feb 2014, and will be priced in the range of Rs 60,000 to Rs 65,000. According to Amit Gujral, head - marketing at LG India, the exact pricing will be disclosed closer to the phablet's launch. The device also sports new user experience (UX) features that take advantage of the curved form factor. In addition to the phablet, LG has also unveiled a 55 inch curved OLED TV (55EA9800) that has been priced at Rs 9,99,000. Here is a look at the specifications of the phablet. The phablet has a 6-inch HD curved P-OLED capacitive touchscreen display (1280Ã—720 pixels resolution), and runs on the latest Android 4.2.2 (Jelly Bean) operating system. It is powered by a 2.26 GHz quad-core Qualcomm Snapdragon 800 processor and has 2GB of RAM. The internal memory of the device is 32GB, but further memory expansion is not available. According to LG, the vertically curved design reduces the distance between the users mouth to the microphone when the device is held against the ear, as traditional telephone handsets used to. It employs a curvature arc that is optimised for the average face, to deliver improved voice and sound quality. The curved form also increases the sound level by 3dB compared to typical flat smartphones. In addition, in landscape mode, the display offers an IMAX-like experience, with a comfortable viewing angle for watching videos or playing games. G Flex has an 13 mega pixel autofocus rear camera with LED Flash that can record full high definition videos (1080p) at 60 frames per second and a 2.1 MP front-facing camera for video calls that can also record full HD videos at 30 fps. On the connectivity front, the device has Bluetooth 4.0, Wi-Fi (with Wi-Fi Direct), Near Field Communication, 3G and 4G (depending on the region). It also comes with a micro USB port but has no microSD card slot. The device has a 3,500 mAh battery and comes with GPS (with A-GPS support). The phablet measures 160.5mm x 81.6mm x 8.7mm and weighs 177 gm. It will be available in titan silver colour. It also has FM Radio with RDS. 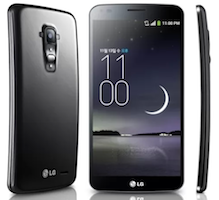 LG G Flex also features the 'Rear Key' first introduced in the LG G2. Devoid of any buttons on the sides, the company has relocated all the physical buttons to the rear of the device. The keys that have been placed at the rear of the smartphone (just under the camera) include the volume keys and the power button. New UX features include QTheater- gives users quick access to photos, videos and YouTube right from the lock screen. By touching the screen and dragging outward along the curved surface with both fingers, the apps appear with the effect of theater curtains being drawn; Dual Window- divides the wide 6-inch screen into two separate windows for more effective multitasking; Swing Lockscreen- alters the image on the lockscreen depending on how the G Flex is held; Face Detection Indicator- displays the LED on the Rear Key in green to confirm status of face detection and focus; and Urgent Call Alert- flashes the LED on the Rear Key in red when several consecutive calls from the same person go unanswered. Earlier this year, Samsung had taken the wraps of the world's first curved phablet, christened Galaxy Round. The device is in many ways similar to the recently launched Galaxy Note 3, except for its curved display and the exclusion of the S-Pen. To leverage the curved screen, the company has also added a number of features to the device, read here to know more.